David Talbot is pictured to the right. Politically speaking, Talbot's on the left. 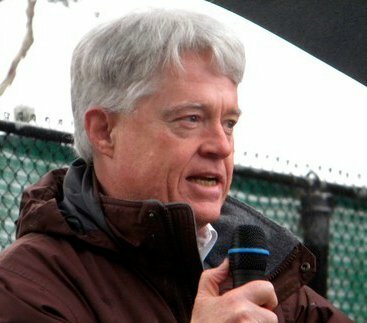 Talbot is a longtime San Franciscan, journalist and author. His book, Season of the Witch, is a history of San Francisco from the 1960s to the 1980s. Talbot is also the author of The Devil’s Chessboard: Allen Dulles, the CIA and the Rise of America’s Secret Government. Talbot founded the pioneering online news site Salon, and was an editor at the Hearst-owned San Francisco Examiner. He has been published in The New Yorker, Time, The Guardian, The Los Angeles Times, and many other publications. 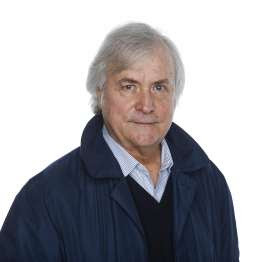 Talbot's columns are now running three times a week in The Chronicle, found online at SFChronicle.com. That's where I got this biographical information. On February 9th, the print edition of the Chronicle put the following headline on Talbot's column: "The case for calm in resistance to Trump." I appreciate the sentiment, and recommend the column. "Calm" resistance seems like a good strategy to me. "Resistance," per se, is what many have identified as the appropriate response to the actions and statements of our current president, but without the modifier, "resistance" could quickly get out of hand. The idea that "resistance" to ill-considered and unconstitutional actions ought to be carried out "calmly" seems like very good advice. Donald Trump’s regime is rapidly reconfiguring the United States into an authoritarian state. All forms of dissent will soon be criminalized. Civil liberties will no longer exist. Corporate exploitation, through the abolition of regulations and laws, will be unimpeded. Global warming will accelerate. A repugnant nationalism, amplified by government propaganda, will promote bigotry and racism. Hate crimes will explode. New wars will be launched or expanded. Americans who remain passive will be complicit. As you will note, Hedges suggests that our worst fears will be realized. We are already cooked. Are we actually willing to concede that? Talbot not only refers to Hedges. He also refers to a suggestion by Rosa Brooks, a law professor at Georgetown University Law Center who served as a human rights counselor to the Clinton State Department and the Obama Defense Department. Without directly advocating this, Brooks observes that "a military coup" could be a solution to the bad Executive Orders and other "crazy" policies being advanced by President Trump and his cohorts. So, Hedges says we should be trying to make our nation "ungovernable," if we don't like the person elected to be our chief executive. Brooks suggests that we should (implicitly) admit that we can't govern ourselves, and turn the job over to the military. I'm with Talbot in wanting to discourage this approach. I don't think that making the nation "ungovernable" will lead to a good result. I am also with Talbot in thinking that our government is not going to get better if the military takes it upon itself to carry out a "military coup," and to decide what's good policy and what's bad policy for all of us civilian types. Instead of "calm" resistance, those suggestions sound like "hysterical" resistance to me, and I don't think that public hysteria is going to make our government better. Quite the opposite. It is precisely when civil life appears to become "ungovernable" that authoritarian dictatorships arise, and these are all too often fronted by military men who promptly put everyone under their military command. Let's be honest. We are facing terrible times ahead. Our president is, in many ways, "crazy," a word employed by Talbot. The President's policies, are, in a very large part, wrong-headed and of dubious constitutionality. What should we do? 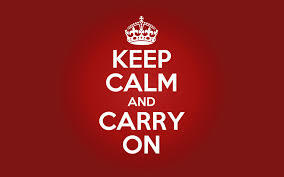 Let's "keep calm and carry on," as the Brits aspired to do just prior to World War II. It is important to take seriously predictions about all the bad things that can happen to us (and that are being threatened - no doubt about that). But predictions are not the same as destiny. What actually happens to our nation in the future will depend on what we do. "Resistance" to authoritarianism is absolutely required. But let's demonstrate that the United States can govern itself, even with Caligula in The White House. That's what maintaining a government "of the people, and by the people, and for the people" requires of us right now.